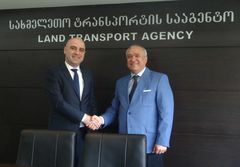 On 4 May 2015, within the framework of the visit to Georgia, Mr. Mircea Ciopraga, Secretary General of the PS IGC TRACECA met with Mr. Mikheil Khmaladze, Director of LEPL Land Transport Agency at the Ministry of Economy and Sustainable Development of Georgia. During the meeting, Mr. Ciopraga mentioned that improvements in land transport field are an essential component for the development and regional integration of the member-countries of the IGC TRACECA. According to the IGC TRACECA Strategy, smooth and uninterrupted flow of trade for all types of freight, across different modes of transport, including road transport and across different countries is one of main pillars. Moreover, Mr. Ciopraga added that TRACECA multilateral permits to be enforced by the signatory countries from 1 January 2016 will also contribute to the implementation of this process and ensure access to the world market of road transport. Within the discussion Mr. Khmaladze briefed Mr. Ciopraga about activities of Land Transport Agency. Mr. Ciopraga and Mr. Khmaladze discussed the status of the implementation of international conventions, priority actions, activities and the monitoring in land transport field of Georgia. On the meeting Parties also touched the issues of actions and activities within the realization of TRACECA Regional Road Safety Action Plan implemented within the ongoing TRACECA Road Safety II project. Mr. Khmaladze expressed his opinion on the necessity of continuation of follow-up projects of the ongoing project of Road Safety II. During the meeting Mr. Khmaladze raised an issue of TRACECA’s future possible cooperation with China especially in direction of road transportation, which shall serve for the revival of Silk Road. Besides, Mr. Khmaladze also highlighted the importance of TRACECA road permits and at the same time underlined the necessity of granting more privileges to it (e.g. like it is in reference with ECMT/ITF road permits).